It's a heavy lift, but historic venues can be saved. And they improve the value of the properties around them. For years, I enjoyed breakfast at Ralph’s Grocery & Deli, with a friendly staff, pleasant atmosphere, quality products, flower baskets hanging outside and open until 2 a.m. It was beloved by everyone from Belltown residents to cruise-ship passengers. It closed in 2015 after 31 years of local ownership, leaving an absence that can’t be filled by the national chain drugstore now occupying the same space. I still mourn. Similar losses have happened all over Seattle. So it’s no wonder that the potential destruction of the Showbox Theater on First Avenue, to be replaced by an apartment tower, has caused such a primal civic scream. The City Council extended historic-district preservation protection, but it’s only temporary. Context is important. We still have so many more distinctive and authentic assets than most American cities. More than once, I lived in a place where leaders gathered on an empty concrete slab to dedicate a tiny farmer’s market, promising it would become “the next Pike Place Market.” Well, no. This has always been a city on the make — New York Alki (by and by), the name bestowed on the original Denny settlement in West Seattle — a center of commerce with rapid booms and some busts. But in the age of giant companies, the death of local institutions and, for Seattle, Sunbelt-style population growth in a small space, pushback is inevitable. Most of all, people love Seattle. Many cities aren’t so fortunate in that, either. Put it all together, and we get the Showbox-as-tinderbox for preservation. But in its homely yet treasured way, the Showbox moment appears galvanizing. Considering the musicians and other cultural figures calling for the theater’s salvation, it seems crass to examine the economics. But it’s necessary in an American civilization that too often knows the fleeting price of everything and the enduring value of nothing. On the surface, the proposition seems simple enough. If land is privately held, it rises to its highest and best use, given legal and financial constraints among others. With this calculus, the Showbox loses to a 442-unit apartment tower in a coveted location of a city with high demand. Still, historic preservation also commands economic value. It’s a relatively young field of study, but the evidence shows that saving pays. “By most accounts, it is more efficient and profitable to preserve a historic building than to construct a new one,” Randall Mason of the University of Pennsylvania’s School of Design wrote in a 2005 survey. Yet even now, the economic benefits of historic preservation run up against powerful interests intent on having their way. The value of preservation has been distorted in many places by sprawl that left center cities dying. Poor city leadership is another potential stumbling block. Property rights are stubborn things, and that’s usually for the best in a nation (for now) with the rule of law. Of course, they aren’t absolute; I can’t run an industrial- recycling outfit out of my condo. But they present impediments to preservation without a willing owner, and sometimes require public incentives. Seattle has enjoyed many notable successes in historic preservation. In the late 1990s, Paul Allen and Frank Stagen saved and restored the 1911 Union Station, when so many American cities had lost these onetime temples of transportation. It was the beginning of a substantial development of new offices around the depot, supporting the idea that historic preservation can create value. It made a difference that Allen is a civic steward with money (he also saved and restored Cinerama). And Stagen’s firm, Nitze-Stagen, has the historic-redevelopment chops to pull off such enterprises. Add in smart city policy, and this is the sure combination for success in any city. The Seattle Tower, formerly the Northern Life building, at Third and University is a glorious work of Art Deco. I think it’s my favorite building in the city, an antidote to today’s army of glass-sheeted sameness and the dreary boxes of the 1960s and beyond. It was saved and is in use. The same is true of the 1914 Smith Tower, at 38 stories once touted as the tallest building west of New York. It was renovated two years ago. A floor was opened as an observatory and bar. And Pike Place Market is, of course, the model of sustained public-private partnership to keep one of the nation’s great jewels shining. With more than 450 sites designated landmarks subject to protection since 1973, Seattle would seem to be well ahead of many cities. Unfortunately — or deliberately, as some critics would have it — many places were left out when growth slipped the leash. One problem for the Showbox is that it’s an ordinary building, unlike the successes listed above. Its value is in the memories and performances that happen inside. 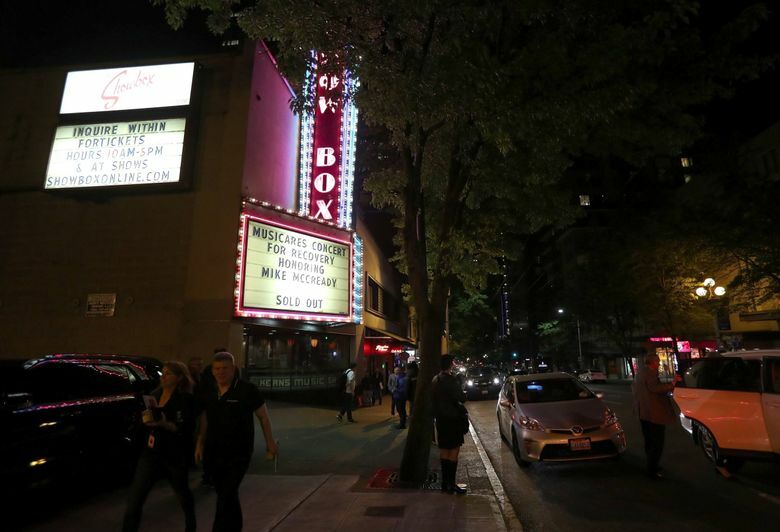 The most direct way to save the Showbox is for moneyed stewards, including musicians who say they love it, to buy the building and land, and place them in a restricted trust. Beyond that, its destiny will rest heavily in the decisions of the developers. Saved or lost, this is a cautionary tale. Save as many Seattle treasures as possible while we can. Yet some things go beyond land and location economics. With online shopping and changing customer habits, brick and mortar stores have been under pressure for years. This is intensified by giants such as Amazon with enormous power over supply chains and prices, with little resistance from government regulators. No wonder the city is full of empty storefronts. Sometimes the loss of local treasures is as simple as the owner getting old and retiring. But so few seem to be picking up the torch. America has more rich people than ever before. But it doesn’t trickle down to Main Street. If I were a trust-fund kid, I’d love to set up a bookstore downtown. It would never have to show a profit and my landlord could never price me out. But most real trust-funders apparently prefer to invest in derivatives or otherwise have people move their money around while they play. It’s a brave new world, baby. I don’t like it. But here it is, and the losses keep coming.